Out of print but occasionally still available from Amazon. Soon to become an eBook. A coast-to-coast hiker-biker guide tracking England’s oldest ridge route, over 400 miles from Portland Bill to King’s Lynn, passing some of the world’s greatest prehistoric monuments such as Stonehenge, Avebury and Grimes Graves. Pedalling with the Prehistorics – crop circles, lay lines and the ancient history of the Chalke Way. 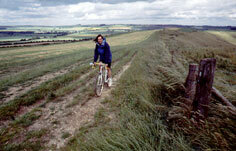 Ride Back in Time – an introduction to the Chalke Way. Still available from Amazon as paperback. Now available as eBook. From Washington, D.C. to Sacramento, CA across the heartlands of the United States following the route taken by the Forty Niners to Californian gold. Undertaken on the 150th anniversary of the first year of the Gold Rush, this is a journey through nineteenth century America as much as a one undertaken at the turn of the 21st century. The National Road – a journey down America’s first and only federal highway from Cumberland, Maryland to St. Louis, Missouri. The California Trail – following the line taken by the gold seekers from the Kansas River to Sacramento, CA. 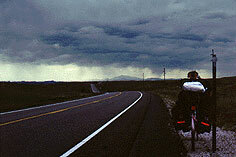 Rider of the Storm – ten miles of terror caught in a lightning storm crossing Wyoming, USA.